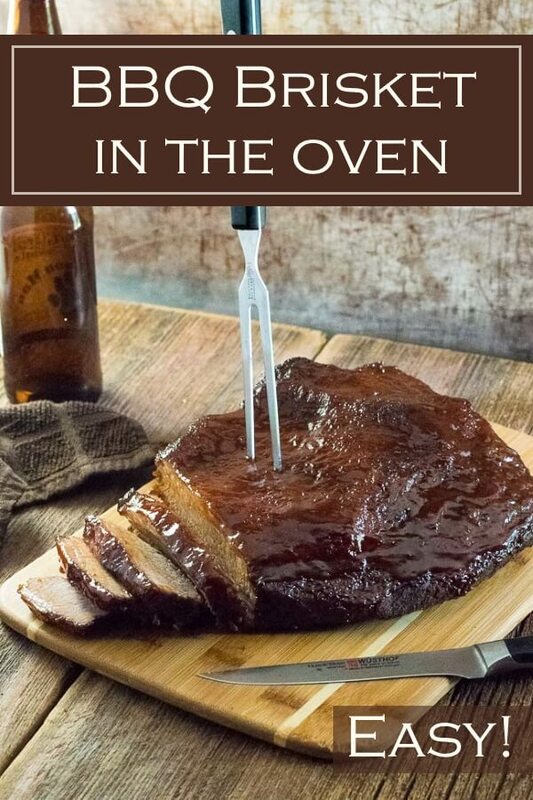 If you are looking for an easy way to make BBQ brisket in the oven but you don’t want to spend all day and night doing it, then this recipe is for you! Yesterday I went hiking a mile and a half through the sweltering hot and muggy swamp because I apparently lack good decision-making skills. Sweating off the bug spray with each muddy step, I contemplated just drinking it and letting my body self-baste. You would think after 2 hours of inhaling mosquitoes by the gallon I would have been plenty full, but I had a roaring appetite when I was done and thankfully BBQ brisket waiting for me back home. BBQ brisket is, in my humble opinion, one of the greatest summer treats known to man. Although, the excessive amount of time required to properly smoke a beef brisket prevents most people from enjoying it at home. However, there is no reason why you cannot cook BBQ brisket in the oven instead. 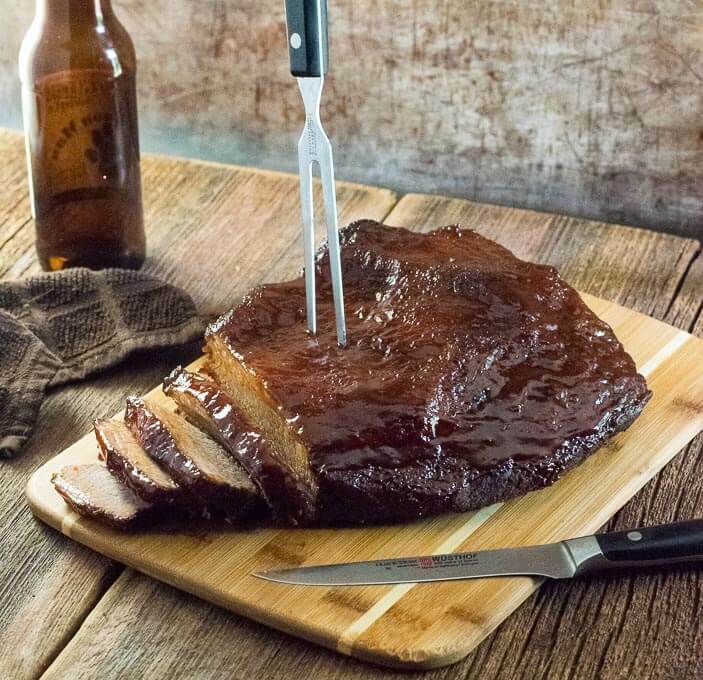 Admittedly, you will not replicate that ‘drenched in hickory smoke’ flavor from authentic bbq brisket, however, you can still craft a mouthwateringly tender brisket infused with bold BBQ flavor, in only a fraction of the time. Flat cut briskets are leaner and more uniform in shape, resembling a thick textbook. These are great for serving because of the perfectly uniform slices you can create. Point cut briskets are considerably more fatty, which can also mean more flavor and moisture. Point cuts are also referred to as the deckle. For my BBQ brisket recipe, I recommend using a flat cut brisket. If you choose to use a point cut instead, you are welcome to do so, however cooking time may vary. As a compromise between time efficiency and maximum flavor, I cook brisket in the oven at 300 degrees, rather than the 250 degrees you would typically use in a smoker. You are welcome to cook it at 250 degrees or 275 degrees in the oven if you prefer to keep the temperature lower, but plan on it taking a couple more hours. Personally, I feel the best way to make brisket in the oven would be to gently roast it uncovered at 250 degrees until it is tender, but that will likely take much longer than the average home cook will tolerate. Not to mention, it is hard to plan for supper time when your entree may take 6 hours to finish or 14 hours! Plus, my method for baking brisket calls for it to be wrapped in foil, allowing you to infuse it with additional flavors like liquid smoke and Worcestershire. Some recipes call for braising brisket in a beef broth while it cooks. I have tried this and was disappointed to find my “BBQ” brisket tasted like beef stew when it was done cooking. Cooking Brisket with the fat cap up or down is largely personal preference, and there are great pitmasters that do it both ways. When making brisket in the oven I prefer to keep the fat cap facing up so it can baste the meat as it renders. Cooking a brisket in a smoker can take all day and all night, however, you can cook brisket in the oven in only three to four hours. The key to shortening the cooking time is to wrap the brisket in foil, also known as the Texas Crutch. This traps the moisture in with the meat, dramatically speeding up cooking. Unlike most meat, you do not pull brisket when it reaches a specific temperature. Instead, you need to keep cooking the brisket until it reaches a certain tenderness. You will know the brisket is done when a fork slides into it with minimal resistance and the meat separates when the fork is twisted. This typically occurs when the brisket reaches a temperature between 190 – 210 degrees. There are a few easy steps to making sure your beef brisket is dripping with bold BBQ flavors when it is served. 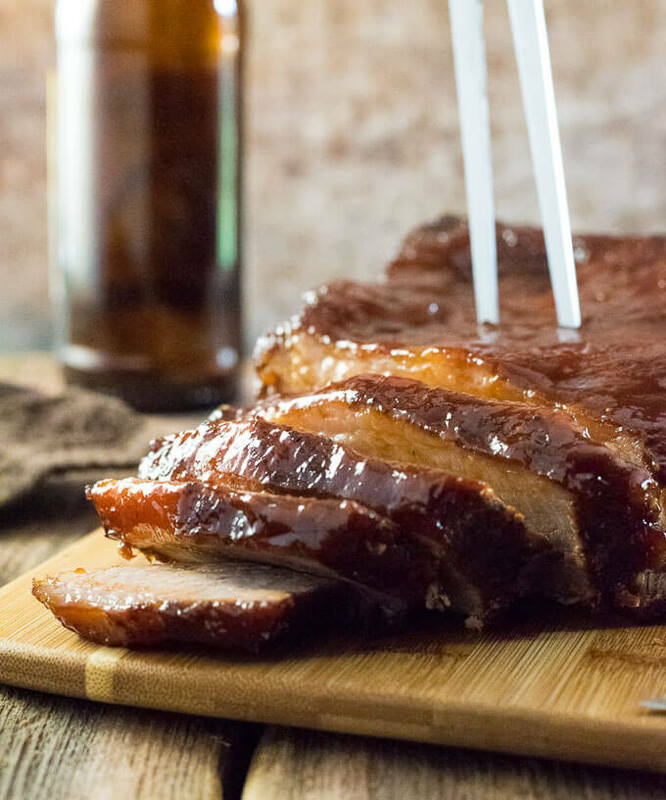 Adding liquid smoke and Worcestershire Sauce to the brisket when it is wrapped in foil will saturate every nook and cranny of the meat with deep smoky flavor while applying a BBQ dry rub will flavor the exterior. However, my favorite trick when making any type of BBQ in the oven is to fire up the broiler. When the brisket is done cooking I briefly broil the fat to firm it up, then liberally paint the brisket with your favorite BBQ sauce (I recommend my homemade BBQ Sauce) and caramelize it under the broiler. It doesn’t take long, and it turns the sauce into a delectably sticky jam! 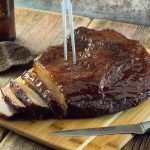 If you are looking for an easy way to make BBQ brisket in the oven but you don't want to spend all day and night doing it, then this recipe is for you! Liberally season the brisket on all sides with BBQ Dry Rub. The brisket can sit in the fridge overnight to let flavor penetrate, or it can be cooked right away. Set brisket on a large strip of foil, fat cap up, and add liquid smoke and Worcestershire sauce, then wrap the foil around the brisket, sealing tightly. Bake in the oven for 3-4 hours, or until the brisket is perfectly tender. The brisket is done when it can be pierced with a fork with little resistance, and the meat separates when the fork is twisted. Remove brisket from oven, unwrap from foil, and turn the broiler on high. Set brisket under the broiler and broil the fat cap until it begins to crisp. Watch carefully so it does not burn. 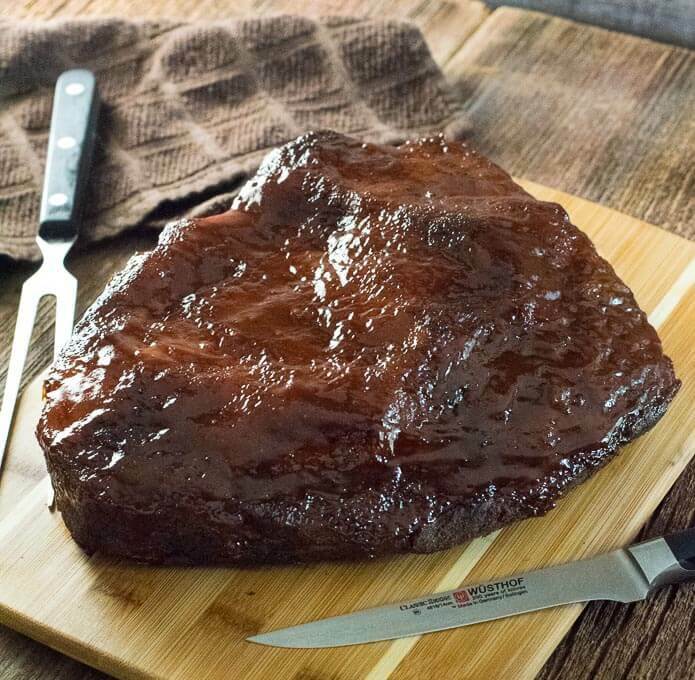 Remove brisket from the oven and paint liberally with BBQ sauce, then set under the broiler again to allow the BBQ sauce to thicken into a jam-like consistency. The sauce will burn quickly, so keep your eye on it. Remove from oven, let brisket rest for 10 minutes and serve. Brisket cooking time will vary from brisket to brisket. If your brisket is not tender when finished cooking, simply cook it longer. IF YOU LIKED THIS RECIPE check out my insanely popular BBQ Ribs in the Oven too! If you enjoyed reading my BBQ Brisket in the Oven recipe then you should probably like me on Facebook and follow me on Pinterest too. That’s what I would do at least, because if you don’t get to know me but you still use my recipe it is kind of like taking candy from a stranger, and your mom taught you not to do that. Don’t disobey your mom, subscribe to Fox Valley Foodie today. OMG I love brisket. This looks so easy! Never cook one in the oven! Always cooked it outdoors..Going to try it in the oven this time. Thanks for your help. I am trying this tonight!! I’m so glad this is a more recent post. I will comment on the results shortly after. It is just after noon now, and is going in the oven in a few minutes. 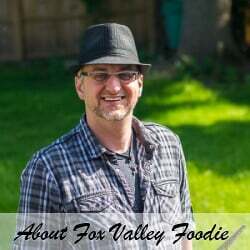 Thank you, Fox Valley Foodie, for your informative blog on cooking brisket in the oven and also the tidbits about your life. Very enlightening. I too enjoy cooking brisket in the oven. I like too cook the smaller size around 3 lbs. which makes a nice meal and doesn’t take too much cooking time, 3-4 hours @ 300-325 degrees. My first taste of a 10 lb. brisket cooked in the oven was one my niece cooked and simple salt and peppered it, covered it, cooked slowly in its own juices and it was awesome! I was hooked from that day. I want to compliment you on not just your blog and sharing your wonderful cooking skills but you must also realize you are a great writer too. Thanks again for sharing and bringing some enjoyment to this thing we call the web. Keep on blogging and have a great day. I used a Texas BBQ dry rub with olive oil and followed your oven recipe after that. The time was on point hot the time it took mine to cook, was perfection. My husband and I both love smoked (outside in smoker) meat, but this recipe yielded the most tender, perfectly seasoned and sauced Brisket we have ever had. If you don’t like a sweet sauce, try adding to your garlic, pepper, salt, Worcestershire, brown sugar final basting recipe before you broil for s few minutes -1-2 tablespoonful of your favorite hot sauce (such as Franks red hot sauce) . Superb and delicious. I like to get several bunches of green onions, 2 or 3 heads of garlic, & several fresh cayenne peppers , or any finger peppers. After trimming the brisket, Take a parring knife & make an incision 2 inches deep every 3 to 4 inhes insert a green onion cut it off at top flush with meat, do the same with the pepper. Peel garlic cut in half lenghtwise, insert in the cut. Then do your rub. i use mace, allspice, curry powder, grn caradom, grn ginger, grn corriander, grn cumin, paprika, onion powder, kosher salt, cracker black pepper, cayenne pepper, white pepper, grn chile peppers into powder, grn tumeric, grn poultry seasoning, dried rosemary. Rub all over brisket with oil, then mix all ingredients in bowl and apply top sides & bottom with rub mixture.Wrap in plastic wrap or tin foil put in frig for 12 hrs. Preheat oven at 260 degrees. take brisket out & take the wrap off, and bring to room temp. Roast fer one hour and fifteen minutes per pound. I use a large tin foil pan. I cut up plenty of onions, celery, carrots, parsnips, leeks and make a bed on bottom of pan, so the brisket is elevated as not be in the liquid. I add beef stock, & water, a couple of inches.. Cover with 2 sheets of heavy duty tin foil sealed & crimped around the edges of pan. Let it cook & no peekin’! I don’t use measurements Or a thermonator. When I think that it is done shake the pan side to side quickly, if the brsket jiggles it is done. Then jack the oven temp to broil, I like bark & burnt ends,……broil fer 20 minutes or until your desired burntness. OH! Don’t forget to turn on the oven exhaust fan. When finished let brisket rest for a half an hour. This was taught to me by my Grans. Wah-Lah! Enjoy!